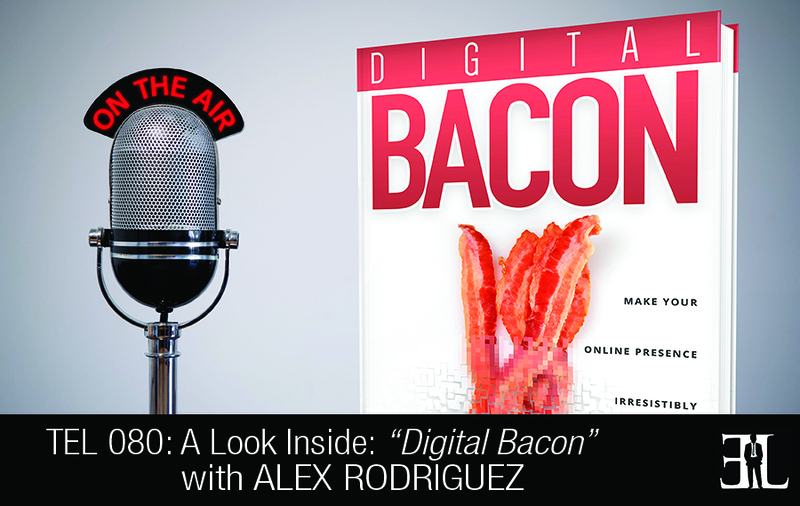 In this episode Alex Rodriguez takes a deep dive into his book, Digital Bacon, where he shares his proven tactics and methodologies to promoting a business effectively online. In his book Rodriguez provides you with a step-by-step campaign for increasing your online traffic, improving your social awareness, and measuring your results. The goal of his book is to make your online presence more engaging and attractive to your audience. This book is perfect for entrepreneurs who are having difficulties promoting a business online and need an all-in-one, easy-to-follow digital marketing strategy. I didn’t see a book out there that talks about a campaign from beginning to end. You can definitely read the table of contents and figure out exactly where you need to start. However, I did write the book in the context of a campaign development process so it is important to start at the beginning to at least understand what exactly I am talking about when I say campaign framework. BACON is an acronym for the five essential components of an irresistibly attractive online presence. The main concept in this book that I am putting forward in the book is to challenge anyone that is working on their online presence to think about it in the terms of a campaign. You need to make sure that it’s researchable, strategic, creative and properly distributed and measurable. If you are lacking on any of those five concepts then I would suggest you step back and really look at how you can incorporate one of these concepts in to your campaign for maximum effect. The objective of this book is how to make your online presence attractive. The title Bacon represents a metaphor for what is attractive to us and it’s also an acronym for the five essential components of a digital marketing strategy. I have looked through hundreds and hundreds of campaigns online and separated the ones that work from the ones that don’t work. And looking at the ones that work I have recognized that all of them have the same five components. With each essential component I match it up with an essential process to acquire this component for your campaign. The B in Bacon stands for Based On Reality. Based on reality we are suggesting you deploy a discovery phase and I teach you how to build a successful discover phase. This includes discovering your current site and social media presence. After that I look at what you offer and take a look at it from a very fresh perspective. I ask very challenging questions to make you think very deeply about what exactly you offer. Then we talk about purchase drivers and I have a whole list about them which is much more than just driving down your cost. Purchase driving is things that really pull the trigger and allow you to sell online. From there we talk about key word research and I teach you how to build that research. Then we look at how to build an audience profile and after you do that you will need to build a persona. With all this research I ask you to narrow it down in to 10 big lessons; the 10 big things that you learned out of the discovery phase. The A in Bacon stands for Aimed Towards Results. Effective online efforts are based on measurable goals and every initiative is informed by a plan customized to its business needs. In this quality I recommend you go in to a strategy phase. Not every business out there thinks strategically about their online presence but I challenge you and show you how to do it. In this chapter I show you how to select a primary KPI which means key performance indicator. I am not talking about business KPI or accounting KPIs but specifically about digital KPIs and I give you a list of KPIs that you can choose and aim towards for your digital campaign. Then we talk about potential competitive exploits and I show you about seven different things that your competitor might be lacking that you might be able to exploit to get an edge up on them. I talk about the difference of strategic schemes, tactics and strategies and I tell you how to differentiate and incorporate them in to your campaign. The C in Bacon stands for Creatively Developed. The phase that corresponded to creatively developed is the production phase. In this chapter I talk about the value of creative excellence that is still very relevant today. I talk about mind mapping, bulleting and creative processes. Then I talk about three mind hacks that have helped me personally. I go in to production timelines and how to produce your assets. The O in Bacon stands for Organized In Propagation. The reason these successful campaigns are found is because they distribute their offer correctly on the web. Here I talk about earned channels verses owned and paid channels. I talk about the difference between those channels and how to utilize them best for your campaign. We talk about distribution framework, how to choose which best works for you and how to deploy them. I have a chapter which is based on the ultimate website pre-launch checklist which is a two and a half checklist for you to apply or hand to your web developer before you launch any web presence online. I also have a formula on how much you should bid for paper click ads if you chose to go that route. The N in Bacon stands for Numerically Measured. These campaigns never measure results in the form of vague adjectives but rather as numbers. They rely on objective measurements to know whether their efforts are moving their business forward or not. This is paired with the phase I call the analysis phase and this is where we go back and check these metrics and make sure that our campaign is on track. I have a section here on revealing your KPI’s you established back in the strategy phase. I also give a couple of testing methods that you can apply in order to measure your online presence and make sure that it’s hitting on point. Finally, at the end of the book I have two pages that include downloadable resources and links to tools that I mention throughout the book. I develop high-end digital marketing campaigns for companies that are looking to transform their brands and attract more business. My focus is launch campaigns and I’ve built some launch campaigns for some of the world’s most renowned brands such as Disney, SeaWorld and the list goes on and on. I was born in New York City, grew up in the Dominican Republic and started my career there in the advertising industry. Now I lead my own agency called Yummy Marketing. We are in a very interesting era which is deemed by many as the digital era. Most everybody has access to tools to become their own advertiser, publisher and media manager but in earlier times you had to do all of that through an agency. With that immediacy of access to these channels comes a very big challenge. Not everybody is used to knowing how to promote their businesses online in a very effective manner. I recognized there was a void for speaking about very trident and proven tactics and methodologies and I decided to write a book to address that point.